Poly & Bark is a relatively new furniture brand specializing in mid-century and modern designs. They have a very intentional catalog that offers buyers quality and design within the mid-century field that is rarely matched by other brands. Poly & Bark is a modern furniture brand, through and through. Their presence online has helped catapult them to a level of success likely scoffed at by more traditional furniture brands. 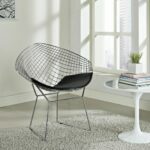 They offer direct-to-consumer sales, and have a very focused product catalog with a wide selection of affordable mid-century designs. Poly & Bark are another exemplary modern furniture brand. Their products are focuses almost entirely on modern and mid-century modern designs. Their products are priced on the upper-end of affordable, but still within range of nearly any budget. Their success has been largely marked by their ‘quality-first’ pursuit of product longevity and design. Much of their catalog is characteristic of iconic Mid Century designs which feature soft edges, natural walnuts and imaginative combinations of simplicity. One great example of this can be seen in Poly & Bark’s interpretation of the Elgin Side Chair which is sold as a set of four. This furniture brand personifies the modern digitally-rooted business connected to customers first, and retailers second. They’ve seen a notable amount of success through online retailers like Amazon, where their product listing is littered with 5 star reviews and positive feedback. This furniture brand has demonstrated the power of going directly to consumers and not wasting any resources on middlemen and exorbitant price markups. It’s likely their products will begin creeping into traditional retail spaces quickly as more and more people demand their products. Poly & Bark is truly an affordable furniture brand that doesn’t sacrifice quality and caters to the design trends most-appreciated by their customers. Poly & Bark are an incredible modern furniture brand which offer modern and mid-century styles at affordable prices. Their presence among online retailers such as Amazon make ordering their products a breeze!